Company Pinnacle or Pinnacle Sports, as it was known in the past is one of the top bookmaker sfounded in 1998. Although without long history of the old English bookmakers, Pinnacle quickly becomes a favorite choice of professional players, especially in the sports section. The company was renamed Pinnacle in 2016 and purchase the domain pinnacle.com. The site has been translated into 17 languages, operating in over 100 countries. The company is rapidly expanding its customers, refer more and more players, who are impressed by the odds that are available on the website and this put Pinnacle at the top of bookmaker’s choice. After loading the site pinnacle.com, we are impressed by the simple look of the page, which has no extra items and menus to make us busy. The company logo at the top left, as well as the registration form or login form for already registered users is clearly visible. The green “Open account” button on the right is easily visible and further facilitates the process for customers, who visited the site for the first time. The colors of the site are traditional for Pinnacles blue and orange, as this does not make it difficult to orient and search for betting sections. On the left, we see the central menu of the various sports sections. Available at Sports Betting: Sports Soccer Betting, Volleyball, American Football, Athletics, Aussie football, badminton, baseball, basketball, boxing, cricket, cycling, darts, sports, golf, hockey, motor racing, Olympic events, poker and politics, rugby, skiing, snooker, table games and etc. In addition to sports betting, you can also bet on a variety of casino games in the Casino section. As mentioned before, Pinnacle have made a very affordable site for both professional and new players. From the Sign up button, you just have to follow the steps one by one to complete the registration form on the online platform. You need to fill in your personal information, such as your full name, home address, phone, username, password and select a currency to play with. Here, the choice is great, besides dollars, euros and British pounds. You have an option for currencies such as Russian rubles, Mexican pesos, Canadian dollars, Polish zlotys, Japanese yen and many others. After agreeing to the terms and conditions of the site and confirming that you are over 18 years of age, at the bottom you can also mark the check box for promotional materials and promotions, where Pinnacle may periodically send you on your e-mail. Pinnacle offers a lot of deposits and withdrawals options with deposit-free tax, except for the Webmoney method, where fees vary. When downloading, please read carefully what fees are charged for the type you choose. Visa, MasterCard, Maestro, EntroPay, Click and Buy, Neteller, Skrill, Poli, bank transfer, etc. are available. The minimum deposit is 10-15 euros and according to the chosen withdrawal method the amounts ranges from 10 to 100 euros. When selecting Skrill users can withdraw up to € 50,000 per transaction. For Netteller the amount is 37,500 euros. You have a choice of over 10 currencies to make your deposits and withdrawals, which is a plus for customers willing to work with different currencies than US dollars or Euros. You have the option of one free transaction withdrawal per month and each other being charged according to the method you choose. Unlike other bookmakers seeking to attract new customers with bonuses for new registered, reward bonuses and other promotions, Pinnacle does not rely on this strategy. The bookmaker attracts customers mostly with high odds for sports events, but not with bonus offers. The only bonus we see available is the cash back casino bonus. For the company, attracting customers through bonuses is not the right policy, but to offering high odds and high stakes. After comparing the leading bookmakers, we can really say, that Pinnacle odds are one of the best. This section is ell made and sports fans can enjoy standard betting and live matches. Again, we emphasize odds, perhaps its one of the strength field of the bookmaker. Professional players choose Pinnacles as their main bookmaker ,because of the good odds and the bet and win limits. Let us add one more advantage – there are no account limits here, so if, for example, a player starts to win very often, there will be no issue with withrawals. This happens in most of the well-known bookmakers, but Pinacle has a policy of not limiting accounts, no matter how big the winnings are and how often they happen. Here you have a choice of a great number of sports events and pledges, but unfortunately there is no Live Streams of sport events. However, we can say that the bookmaker has done very well on sports, and this is one of his strengths. In addition, to popular sports, you also can bets on: NFL, College Football, NBA, College Basketball, MLB, NHL Hockey. Before you make your first bet in the Sports section, you can spend some time on the Betting Resources link, which will provide you with valuable information about betting strategies, the curious and useful tools and it will help, you need to get knowledge at sports bets. Pinnacle is the leader in offering e-Sports. The company is one of the first offering this type of bets and quickly attracts many customers. There are popular games such as CS: GO, Dota2, League of Legends, Star Craft2 and many others. In the Casino section, Pinnacle has prepared live casino games, slots and roulette for its customers. The main focus of Pinnacle Casino is live dealer games provided by Global Gaming Labs. Here you can find live Blackjack, Baccarat, Casino Holdem, as well as American and European Roulette. For Bonus Searchers, only one form of bonus is available – a cash back bonus and a small percentage refund of the amount played. Currently, bonuses for new customers as well as reload bonuses are not available at the Pinnacle Casino section. Pinnacle Customer Service offers an e-mail support and not offered other types of connection like phone and live chat. Although they offer only e-mail support, we can say that it is a fast and Pinnacle team are polite and detailed in their replies. The replays from them take place within a few hours after sending your request. 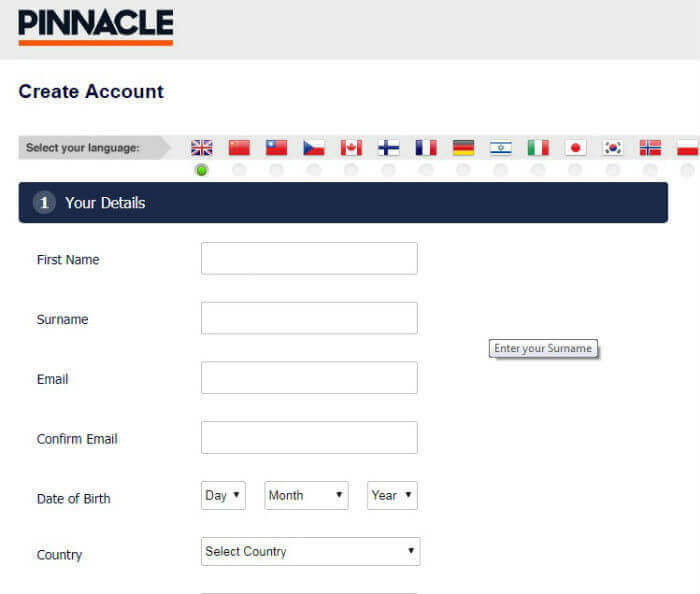 You can use customerservice@pinnacle.com to contact Pinnacles.